In today's world, there are so many people who got scammed into all kinds of investments and get rich quick schemes. How do you protect yourself from these scammers? Naturally I'm concerned that my readers and my friends will fall into these trap. I have been in the financial markets for a long time now and I can smell a scam 10,000 miles away. But for the average person, how do you know that something is genuine or something is a scam? Here are 3 sure fire ways to spot them out. "If it sounds too good to be true, then its too good to be true". Come on guys, use your common sense. The average gain in the stock market for the Dow Jones for the past 100 years is about 9%-10% per annum. A good hedge fund manager can give you a return of 25% a year. Then you have to be extra careful. Today's marketers are quite smart, they will make things seem reasonable. For example, they will ask you to invest 10k and every 3 months you will get back $3k. They will tell you that you can recoup your capital in just 10 months and then you will forever have a free flow of income coming in. Unknown to many, this is the first step for a massive pyramid scheme that ensnares so many people. 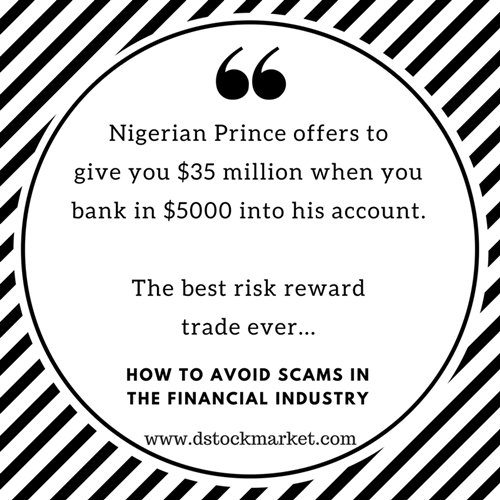 If something requires you to give your money upfront and if it sounds too good to be true, then you should definitely avoid this scam. Alright now we come to the part where people come and ask you to invest with them. They will tell you that if you invest $100k with them, you will be able to get 50% return each year from their stock picks. You don't even need to know what they invest in. All you need to do is sit back, relax and then collect 50% return next year. Well, if they make money for you then its good. But how many investment managers can produce a 50% return annually non stop for 10 years? The bigger the fund the more difficult it is to grow fast. What you need to do when you are approached by such ventures is to ask them for a track record. Look at their performance for the past 2 - 3 years at least. Are they consistent? Are they investing in good companies. Always remember that good trader or investors seldom approach you for money. It is those scams that will be cold calling you non stop. Very talented traders and investors are usually very low profile. You will probably hear about them from your friends or someone inside the industry. They are seldom popular and they do not self promote themselves too much. Their reputation are spread by word of mouth. And the truth is...the good ones don't really need your money. Because they are making so much of their own. If you invest with them, fine...they will take a cut from the profits but if you don't they do not even bother asking you many times. One of the things about scammers is they often like to hide behind a veil. Often times they do not have a real name or a real profile picture. There is something that they are afraid of. They do not want people to know their real identity. And of course, scammers are afraid of the police as well. Because if people know their real name and real picture, the police can be quite fast to put them behind bars. So if you are in some social media and you see someone without a real name or picture approaching you, then odds are they are not upfront. You can expect no transparency at all from their real life and their work. When you go to their website, it is often poorly maintained. They do not have much information about themselves and their website lacks the "genuine" feel of a business that will be there for years to come. Only Put Your Money Into Something That Provides "Value"
The financial industry is there to offer you plenty of services. After all where there is money involved...there will be plenty of services that will spring up like mushrooms. While I am not here to judge the services that the financial industry can offer you, I do hope that you will only invest your hard earned money into something that is "valuable". You will know that something is "valuable" when it leaves you feeling that your money is worth it. If its fake and a scam it will often leave you feeling "empty".